Celebrating the 40th anniversary of her arrival in Britain as a child refugee, Shappi Khorsandi’s ‘Oh My Country! 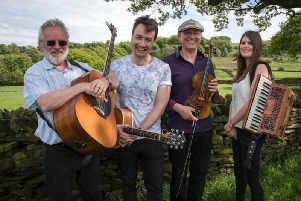 From Morris Dancing to Morrissey’ tour came to Buxton Pavilion Arts Centre this week. The evening opened with 19-year-old comedian Tom Lucy who warmed up the audience more by friction than radiance. Shappi Khorsandi brought a surer and lighter touch, exploring with sharp wit and charm issues of race, nationhood and belonging, particularly relevant in our post-Brexit world. Recalling the shock of skinhead racism and later the acceptance she felt from listening to the music of Billy Bragg, she asserted her love of England and her right to do so. In her examination of what it means to be English, a highlight was her use of her children as two brilliant comedic characters, her grave gentleman of an eight-year-old son, singing ‘Jerusalem’ while spreading potted beef on his toast, and her wild three-year-old daughter, lamenting the death of her goldfish, their English and Iranian heritage jostling for position. At times touching, as for example contrasting the security guaranteed by her red covered British passport with the plight of the stranded migrant children she recently met in Calais, and always presented with great warmth, Shappi Khorsandi’s country is one that seeks common ground amid our diversity.